Sometimes, when a breakthrough technology emerges, expertise is concentrated in a small group of specialists, and one or two regional ecosystems dominate the landscape. In the past, tapping into that knowledge base might have meant attending a few conferences, working the Valley’s network, and then calling it a day. Blockchain is different. Its growing bench of expertise is broad-based, highly distributed, and increasingly international. On BREAKER’s list of the top 10 blockchain cities, only two were in the United States. Silicon Valley came in at #5, lagging behind locales like Singapore and Zug (Switzerland). Even though blockchain’s core technology was invented barely a decade ago, its base of expertise is already broad-based and international. Yes, the United States is at the top, but no country or region has a dominant position. 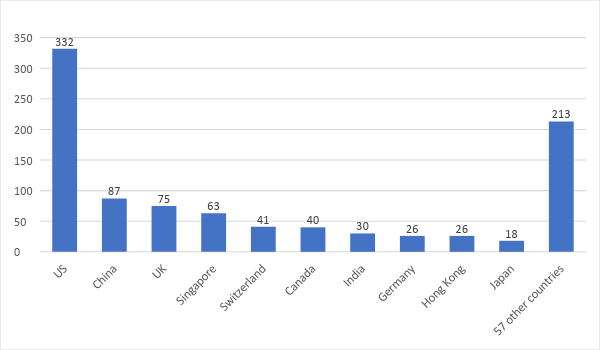 All told, in 2018 there were 1,562 blockchain startups in 67 countries, with 65% of those startups based outside the US. Aergo (Hong Kong) is building a next-gen platform for enterprise application development. Bluecoat (Switzerland) aims to democratize royalty payments to music artists. Cobo (China) has built a next-gen digital wallet for trading all the major cryptocurrencies in one place. Incent (Australia) provides a next-gen consumer rewards and loyalty platform. LaLa World (Singapore) wants to provide a banking platform for migrant workers, the undocumented, and other left-behinds. Shivom (Germany) offers a platform for managing personalized medicine and trading individualized healthcare services. Trende (Japan) intends to use its network of residential solar panel customers to create a peer-to-peer electricity marketplace. The list goes on, and on, and on. The above examples are only a few of the better known and relatively mature blockchain-based startups. Their ranks have exploded in recent years, growing from 98 startups in 2013 to 1,562 in 2018. New firms are popping up constantly, all over the world, almost every day. Big, important chunks of tomorrow’s digital infrastructure, powering a wide array of industries, will likely emerge from this primordial soup. Unfortunately, it is difficult, if not impossible, to predict where in the world those path-defining innovations will initially take root. That creates a colossal headache for corporations and investors trying to scan the technology environment efficiently. Thankfully, Wellspring’s Scout platform accumulates all the information you need, in one user-friendly searchable database. Today’s world is increasingly rife with highly distributed patterns of technology innovation. Having powerful data at your fingertips has become a necessity. We encourage you to learn more on our website or try out the free version today.